First, we explored soil, then seeds as part of our gardening theme. 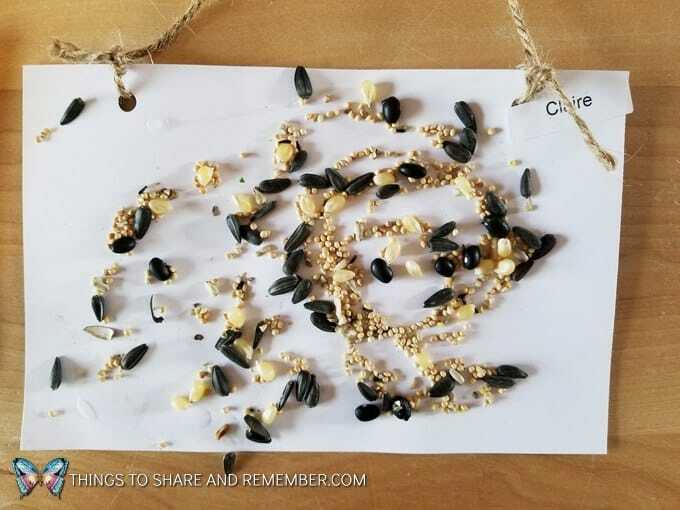 One of our seed activities was creating seed mosaics which turned out beautiful! I’ve been enjoying them all month on display in our room. 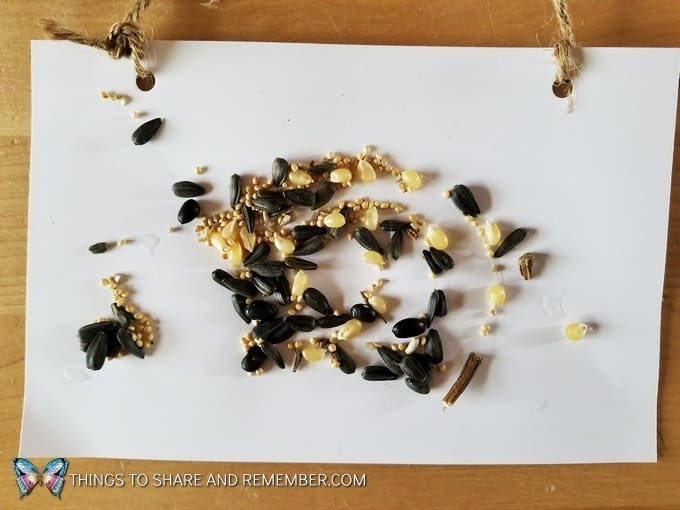 Creating Seed Mosaics allowed the children to explore seeds and handle them to create a design of their own. 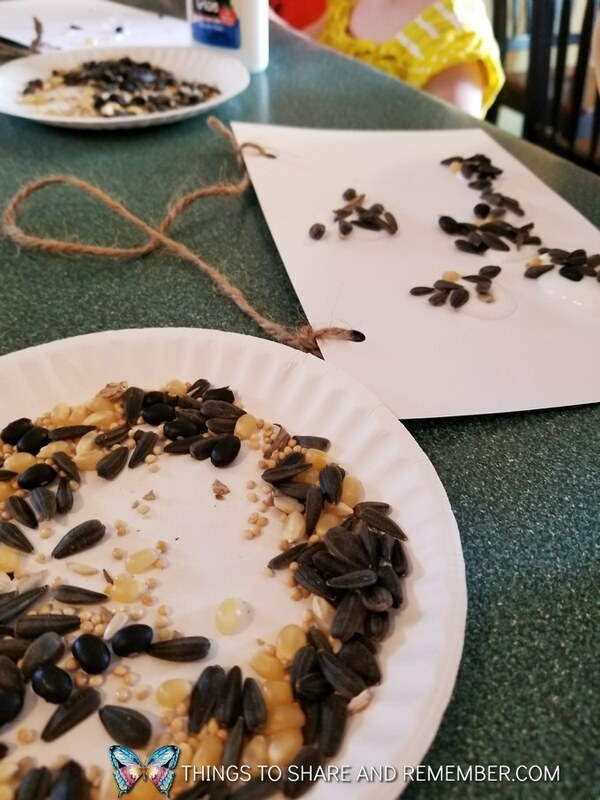 Our seed mosaics required basic supplies Mother Goose Time included in the Growing Gardens box. Look at this beautiful inspiration photo that was included. 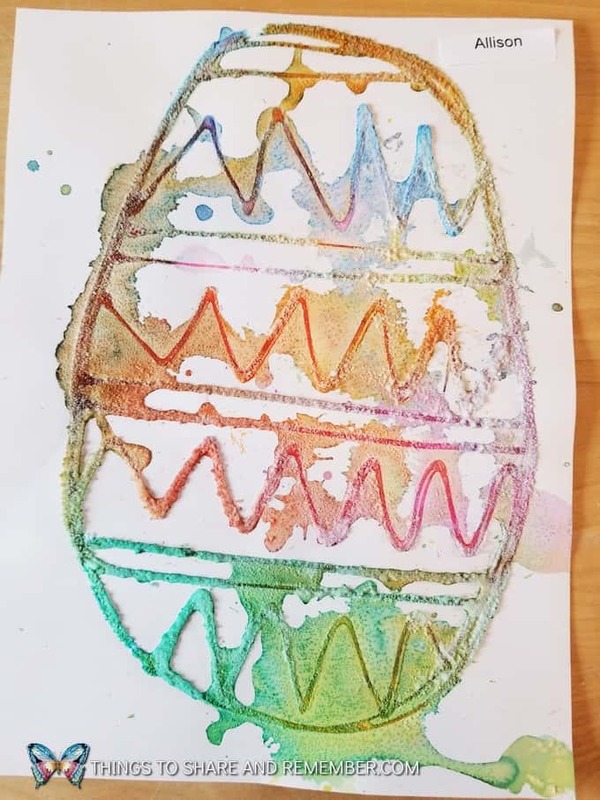 Now, I will admit I had ideas of beautiful well-placed results like this, but in reality, toddlers and preschool results are much different. The idea of a mosaic and inspiration is what’s important. The inspiration photo creates interest, introduces a concept (mosaics in this case) and provides an idea, to begin with. 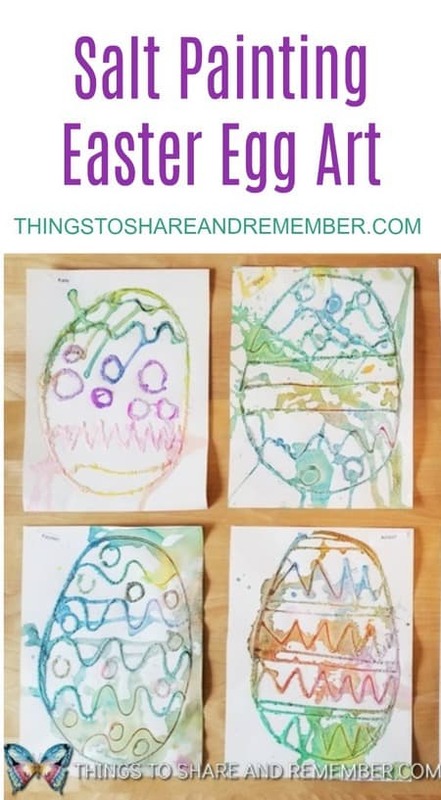 Toddler and preschool skills vary but we’re not looking for the next Picasso here. 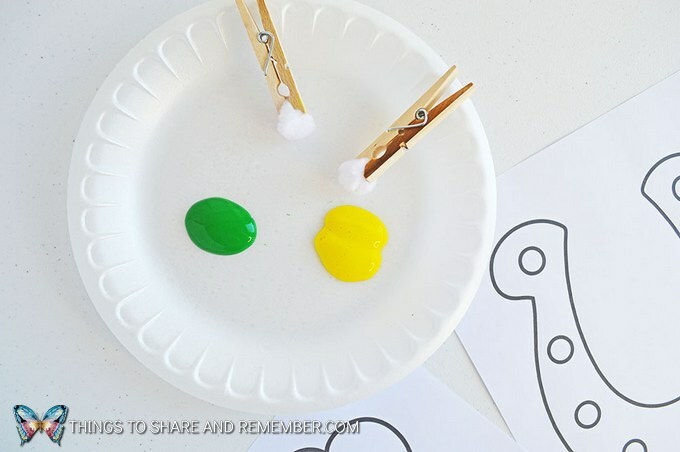 What is the purpose of this activity? 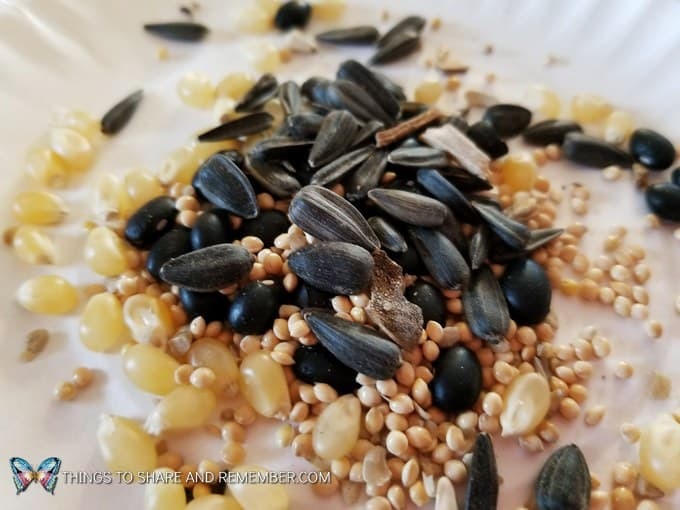 It’s to explore seeds! That’s exactly what they did. 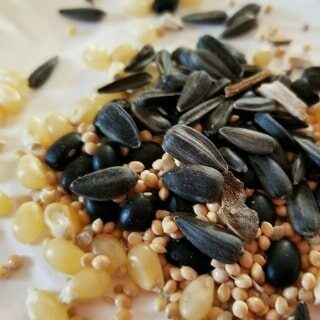 We talked about the different colors an sizes of the seeds. 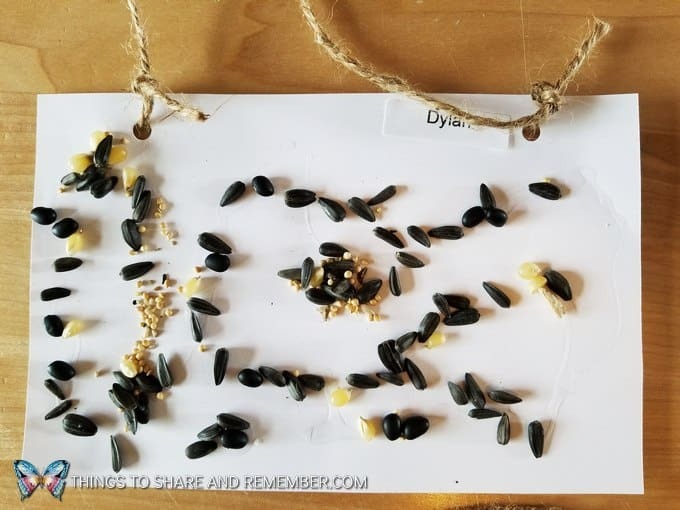 Guessed which seeds produced flowers, grass or popcorn. 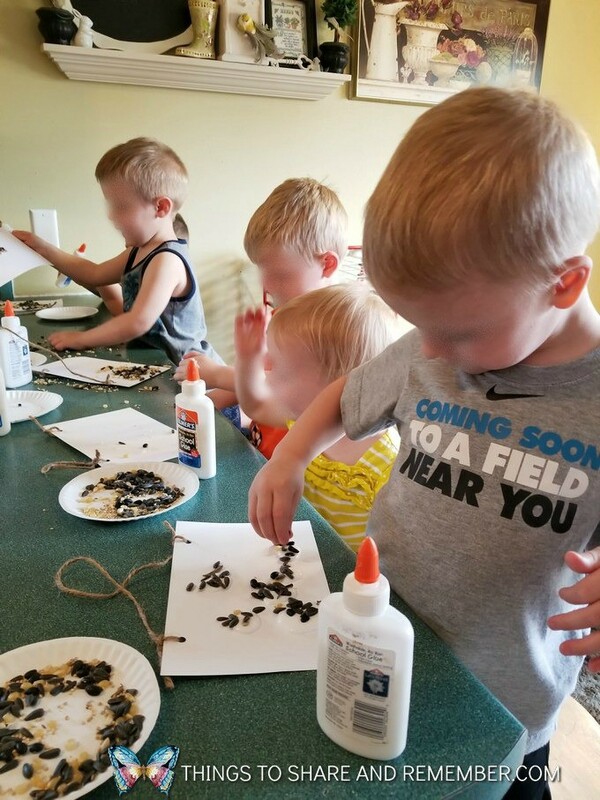 The rest is about the creative process and using fine motor skills to squeeze glue and place seeds. 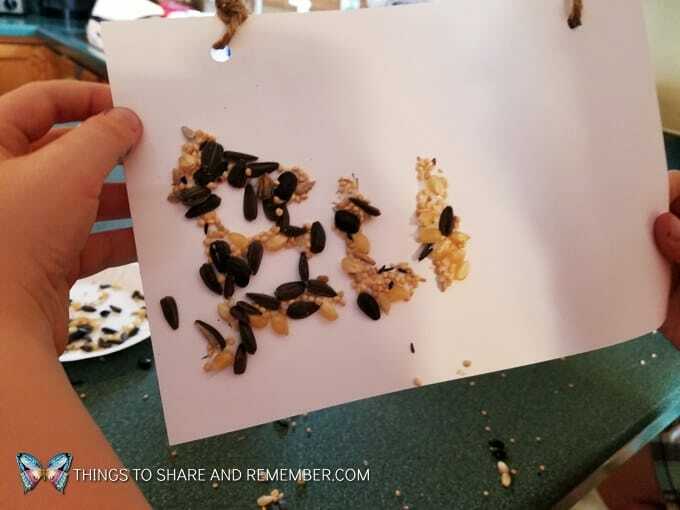 There may be big pools of glue and a few seeds sprinkled. Older ones are more likely to begin planning their art. 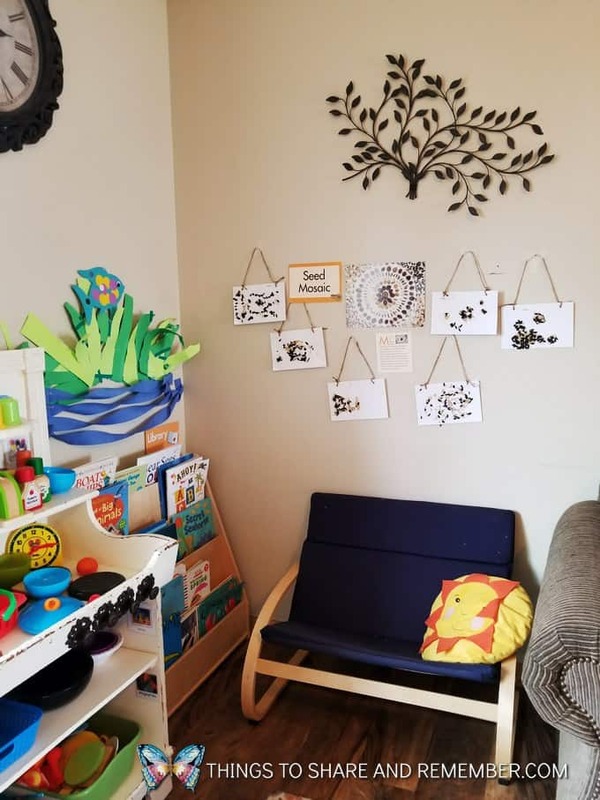 We can guide that process a bit so children learn the concept of what we do first, second or third but sometimes I have to be careful with that because too many words, “rules” or steps and children lose interest. This 4-year-old, said, “I’m going to make my name” and he did. That was purely his idea and he was successful. He was satisfied and I thought it was fabulous. Was it anything like the inspiration photo? No, but that’s not the point. 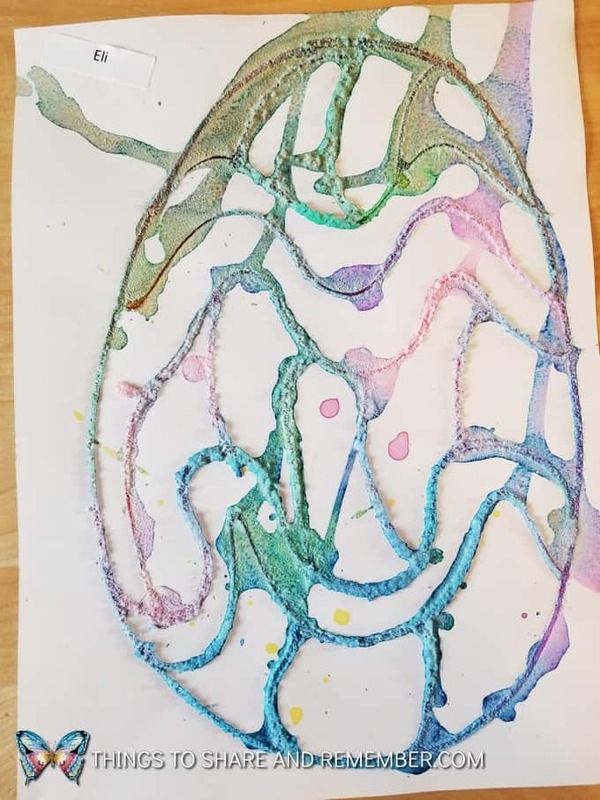 Our youngest, 2 years old, perhaps had the most interesting result but that was because I helped her squeeze the glue. She usually can do it but her bottle was hard to squeeze that day. 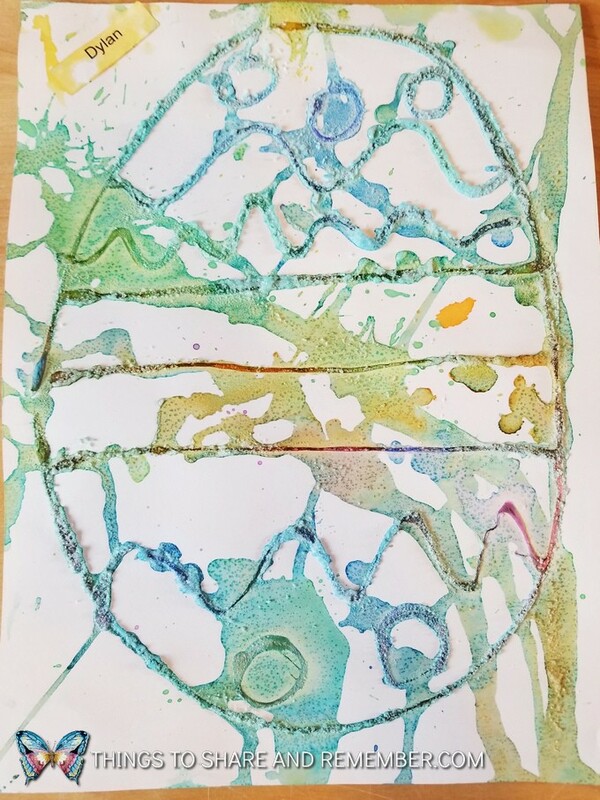 She held on to the bottle and I helped her squeeze and create a circular design on her paper. 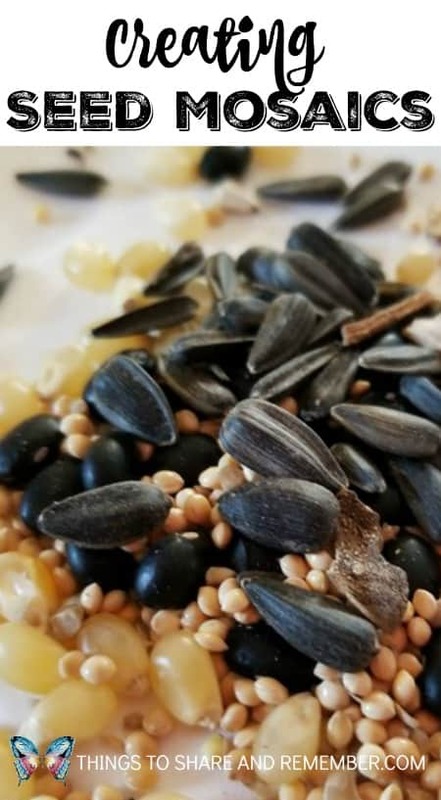 Then she sprinkled on seeds. So pretty! Twine was provided to hang up the seed mosaics. I like the natural look. All different but beautiful art. 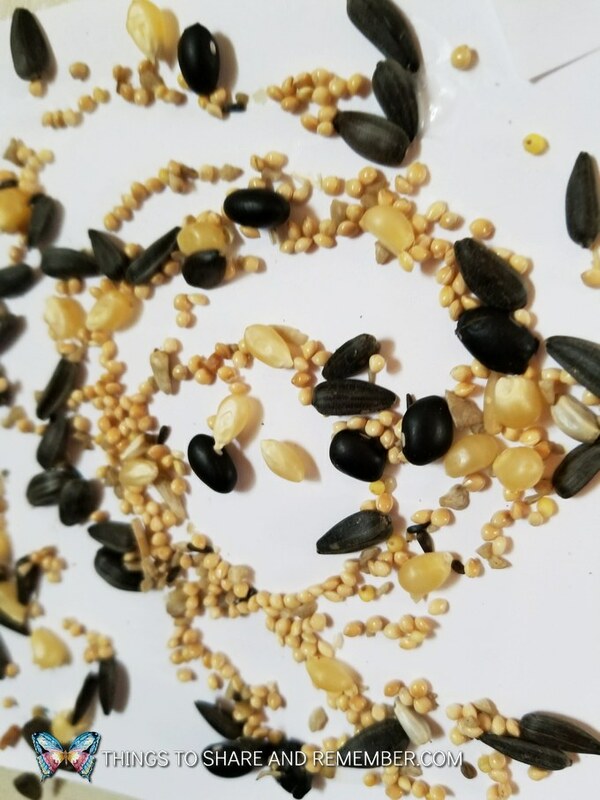 A close up of the texture, shapes, sizes, and colors of seeds. This is our seed mosaic display in our library area. 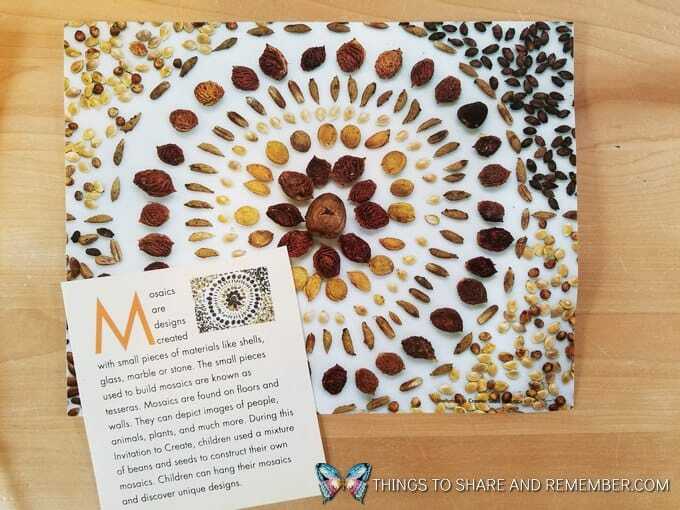 I hope you’ve enjoyed our Creating Seed Mosaics activity. 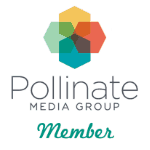 Thank you for following along and sharing in our gardening with kids activities! What’s the way to mom’s heart? 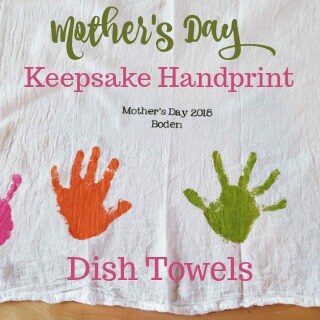 A handprint on anything! 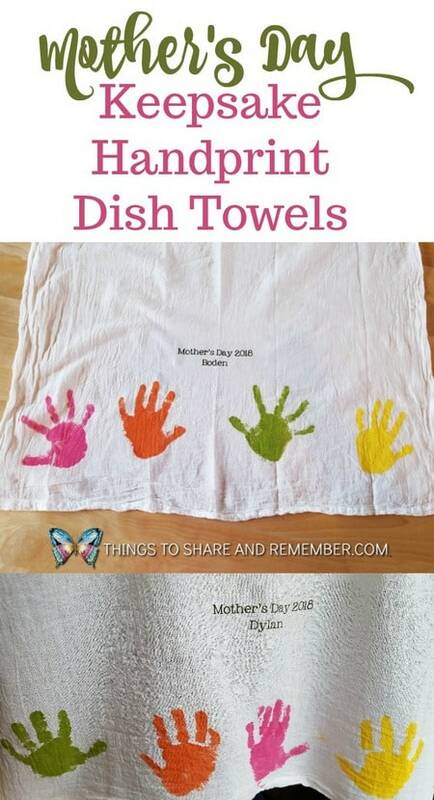 Especially those little handprints. 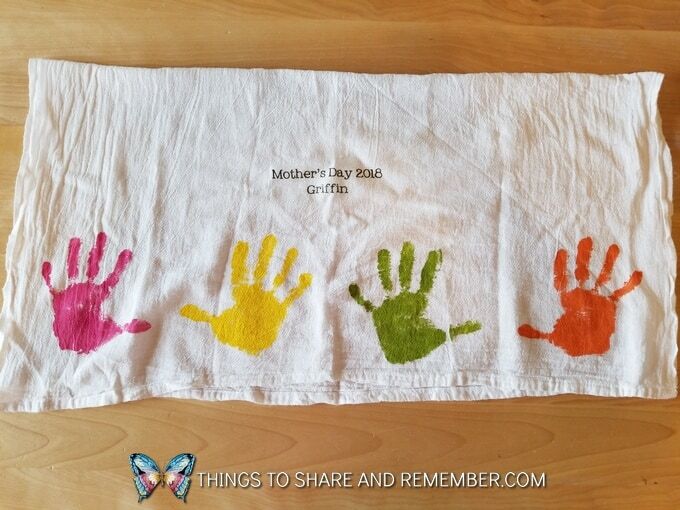 We all know how quickly they turn to be handprints but those small little handprints remain, forever in our hearts. 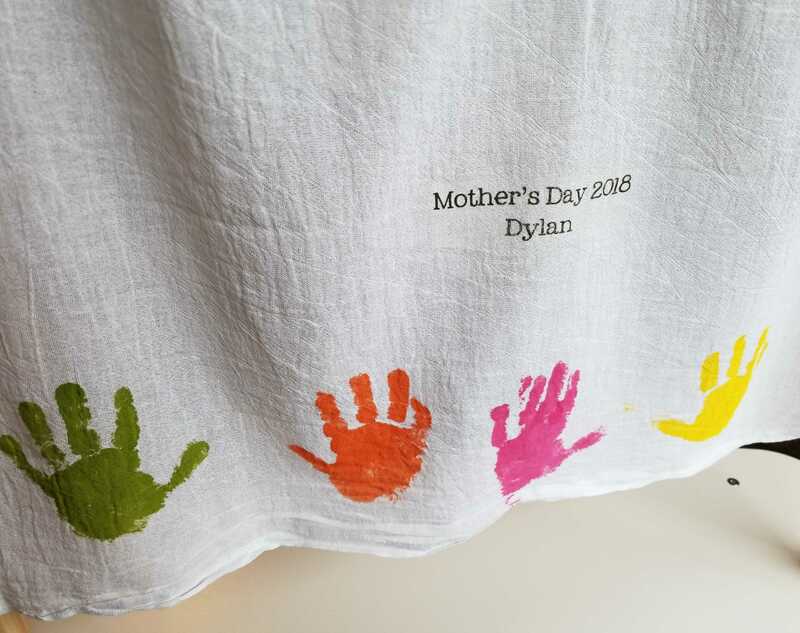 I try to make something different every year with my child care children to give to their parents, so this year we made Keepsake Mother’s Day Handprint Dish Towels. 1. 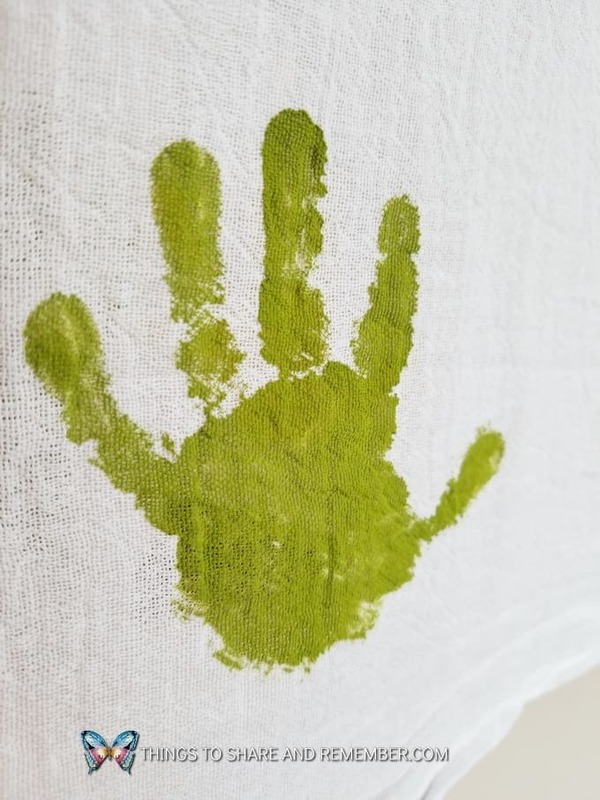 Iron the dishtowel. 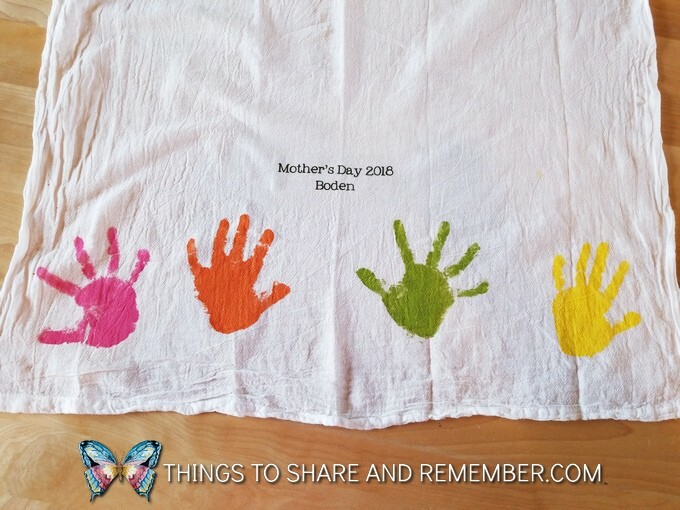 If you don’t (like I didn’t) you may end up with creases in the handprints (like I did). Put the cardboard or paper bag under your dish towel to protect the table. 2. 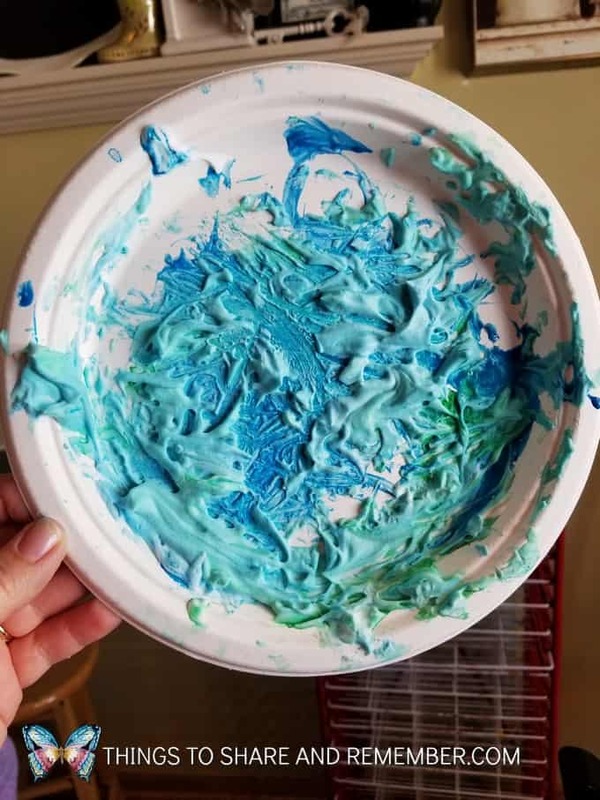 Squirt some paint on a paper plate. 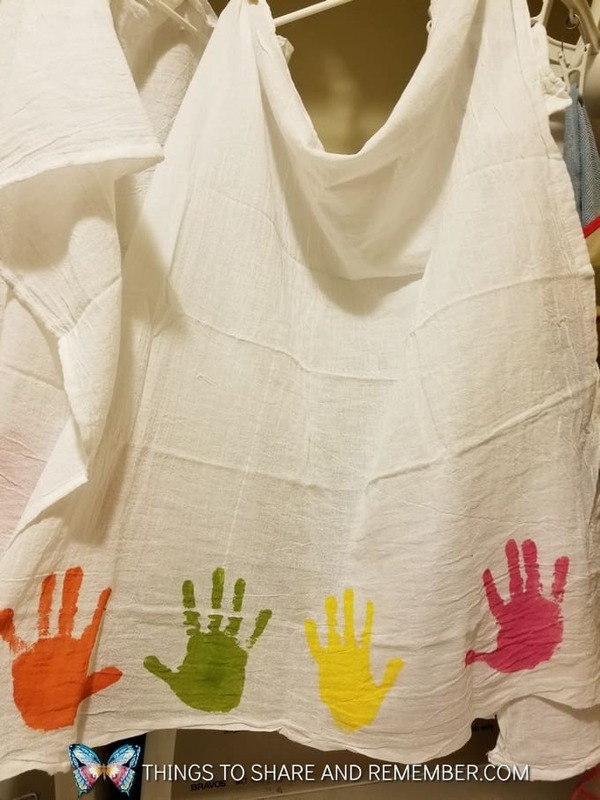 Paint the child’s hand. Press hand down to make a print. 3. Repeat as desired. 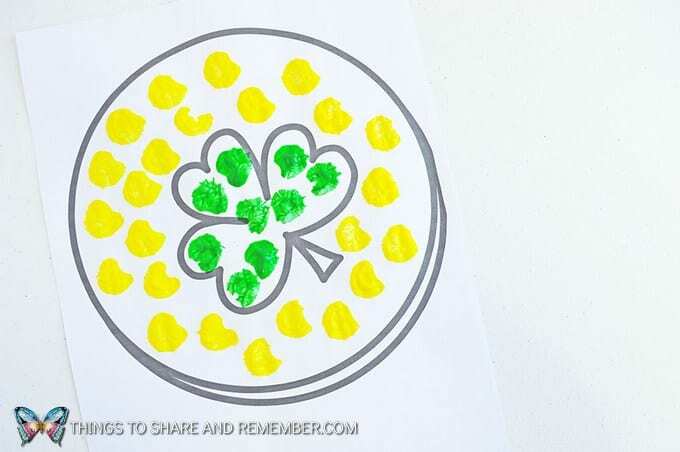 We did left hand, right hand, left hand, right hand in each color. 4. Allow your towel to dry. Leave it laying flat or carefully hang it up. I like the flat, soft finish of this paint. 5. Print out text using Paint or another program. Mirror text before printing. 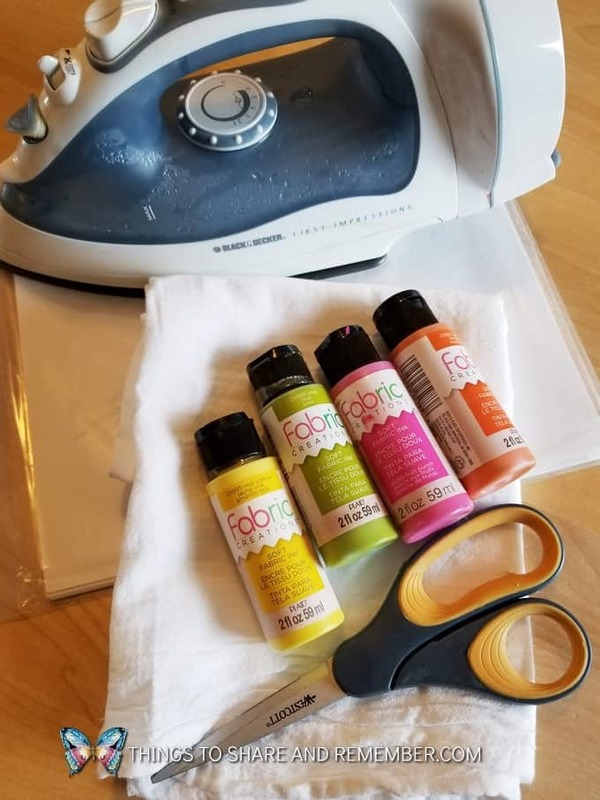 I use Ink Jet transfer paper from Best Blanks. I could have done a better job transferring on a couple of these. I think I rushed it, but the iron on paper is good quality! 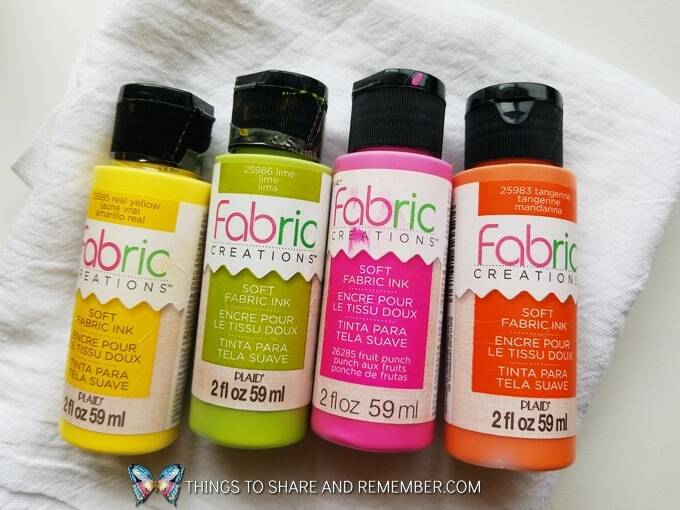 We wrapped our towels in colored paper, added a handpainted card and tied it with tulle. 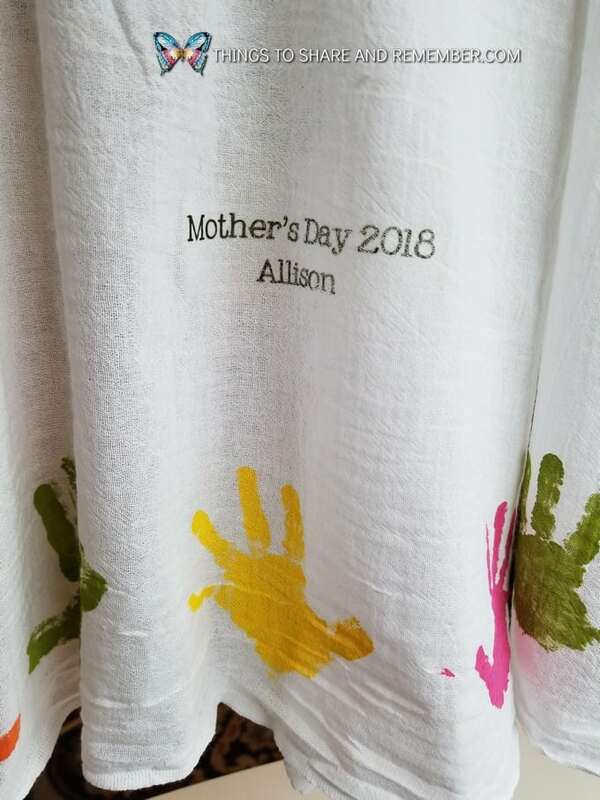 The towels turned out so pretty! 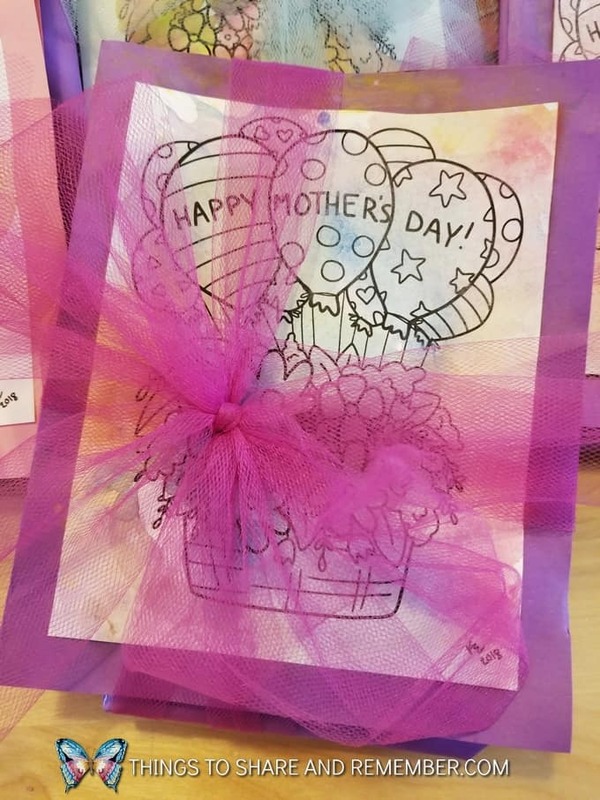 Find the free printable Mother’s Day Coloring Page here. 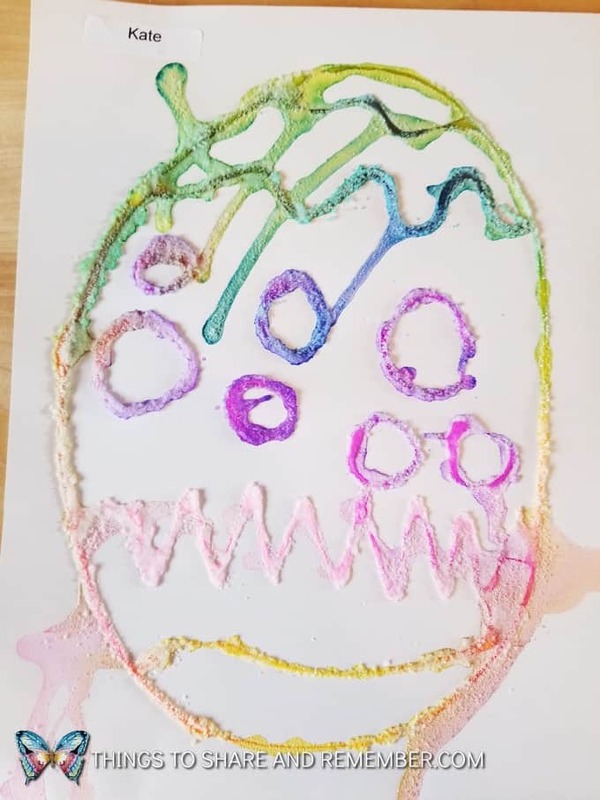 Salt painting is such a fabulous process art activity. 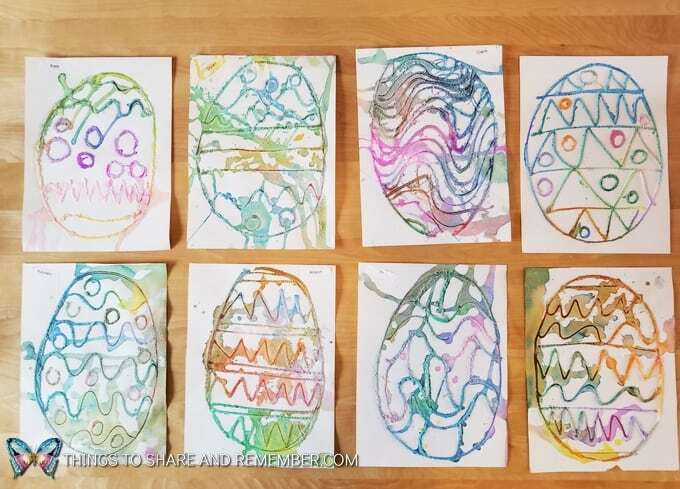 I love it on these fun patterned Easter eggs. 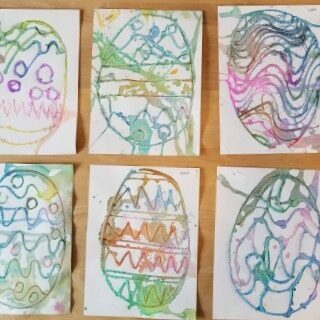 Spring break was the perfect time to use the pastel liquid watercolors and my whole crew of 8 ages 2-8 years enjoyed the same project. 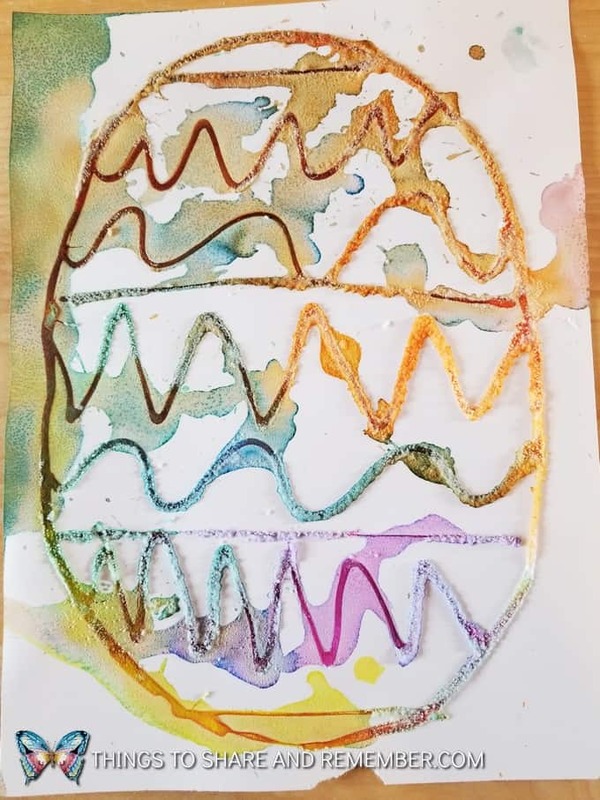 Salt Painting Easter Egg Art creates lovely Easter themed art and incorporates some cool science and fine motor skills. 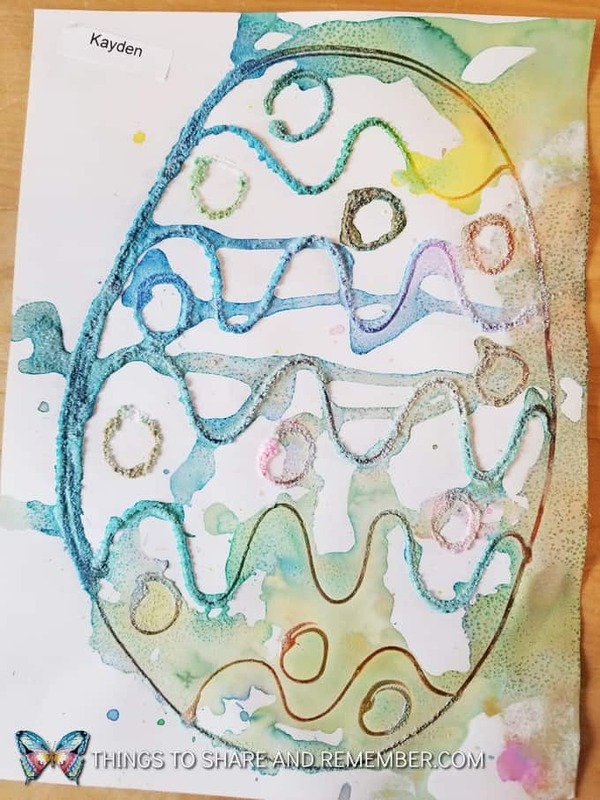 Create an egg design with glue. 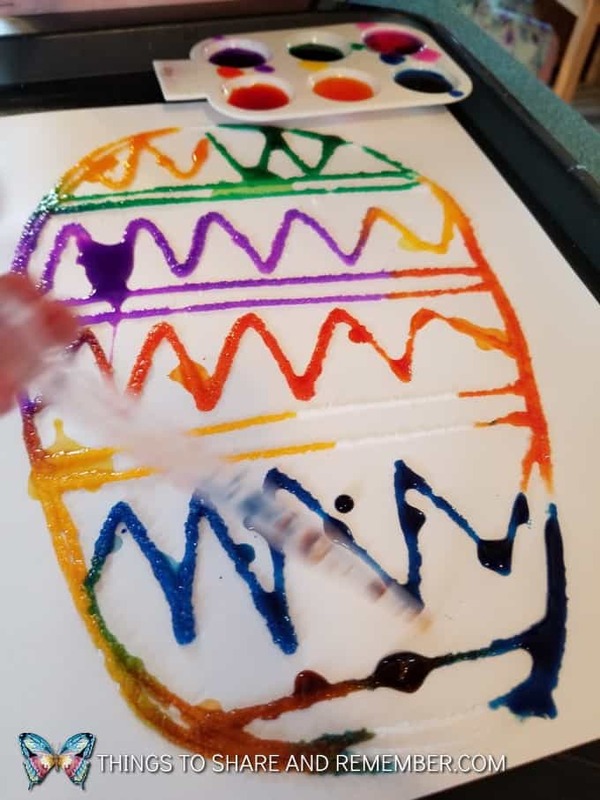 Using pipettes, drip liquid watercolors on the salt. Watch the salt absorb the paint. 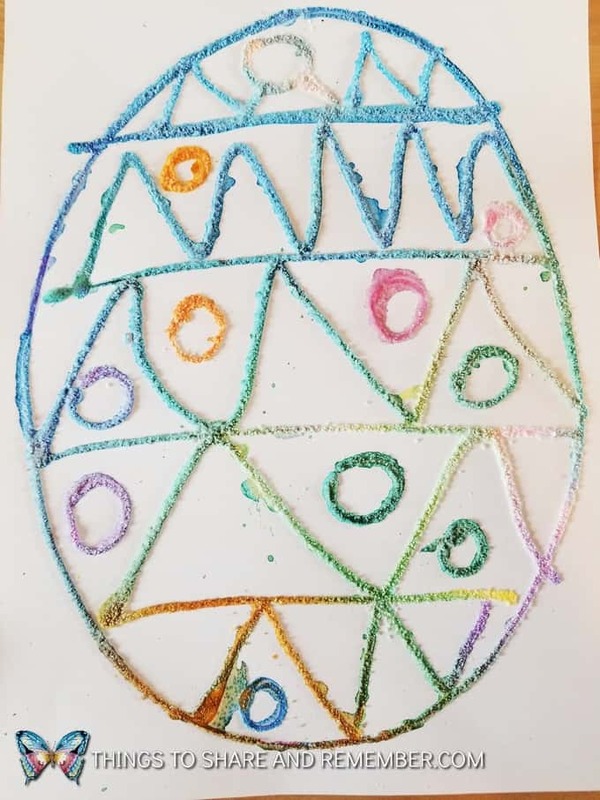 Each child could design their own egg but some of my group is quite young. Also, prepping the activity saved us time. Everyone’s design turned out awesome! The colors dried lighter since we diluted the paints but they are beautiful. 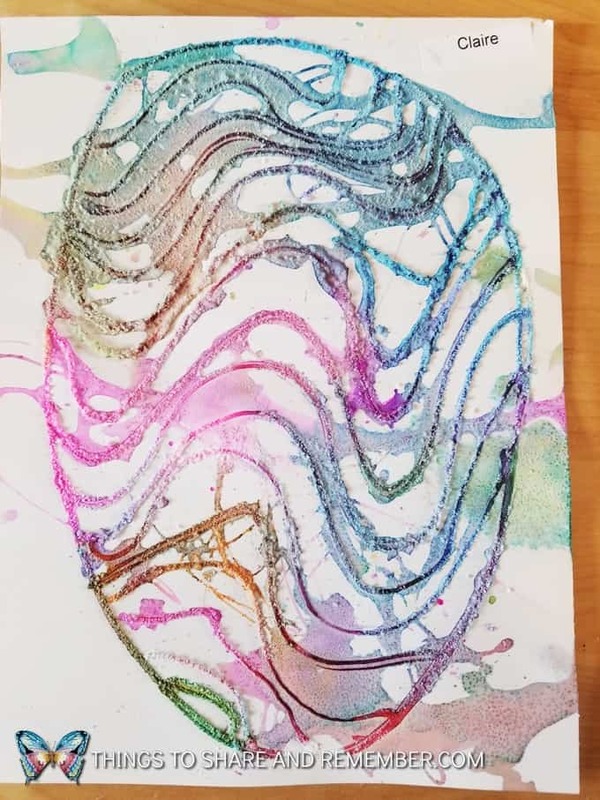 If you haven’t tried salt painting yet, you must! Kids love it. 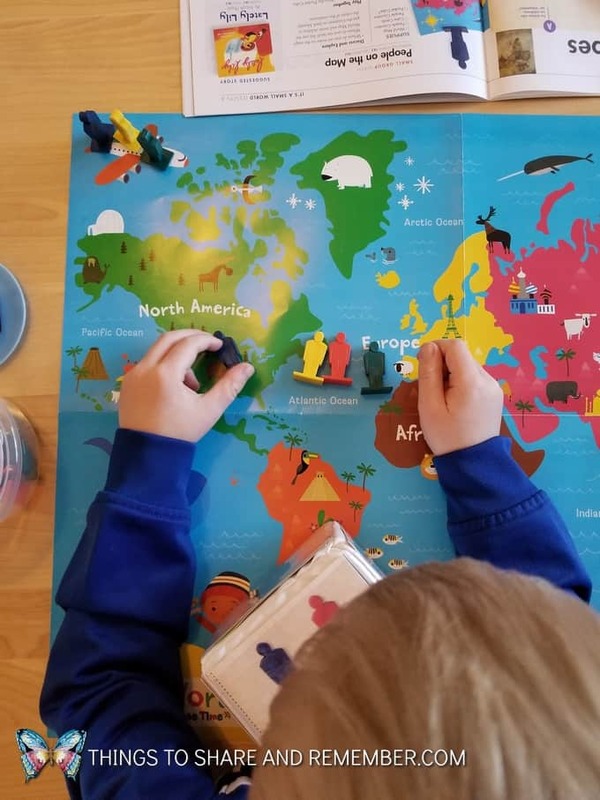 We had so much fun learning about maps and globes! 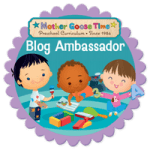 You might think this topic is a bit advanced for 2-5-year-olds, but it’s amazing what they CAN do and learn when the lessons are developmentally appropriate. 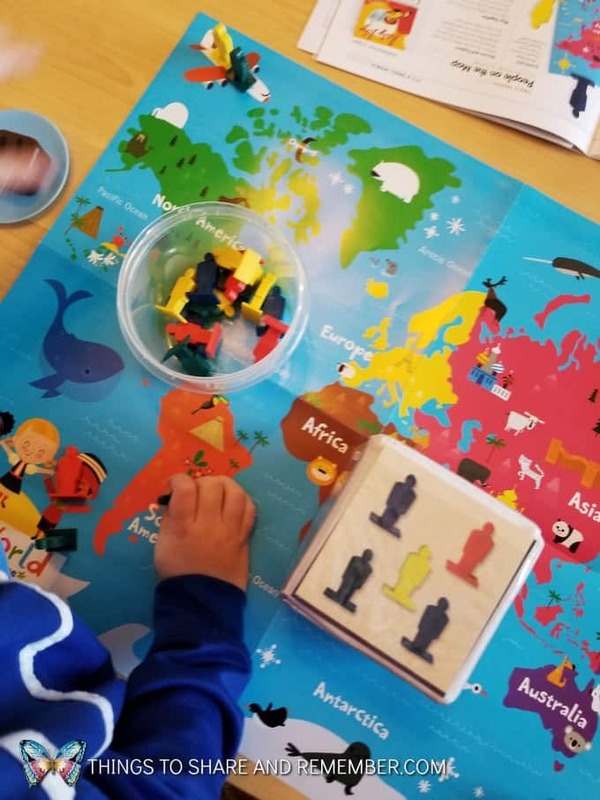 Read on for some fun ideas on teaching young children about maps and globes. Letter G is really our focus here. 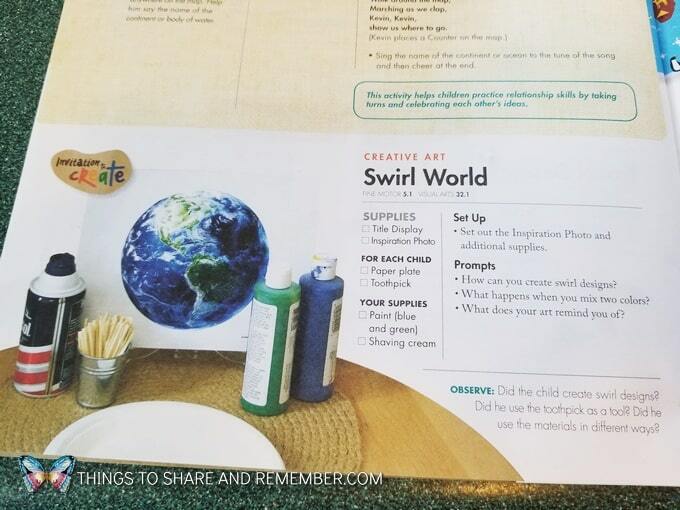 MGT offers the letter pages each month that corresponds to our lessons so in this case, G is for globe. 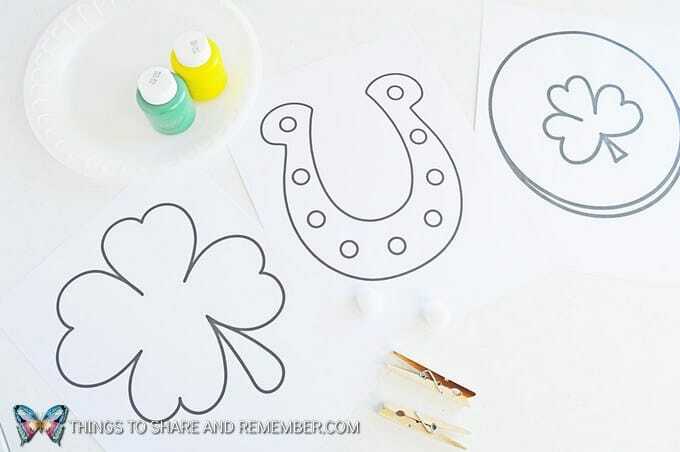 I like the suggestions for using these pages to make them more interactive than just a coloring page. 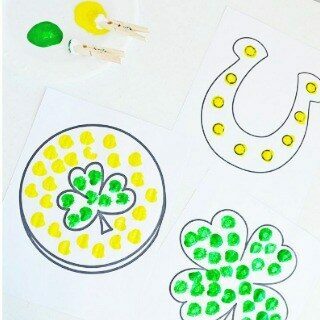 I’ve found that children get bored with coloring pages/busy work in no time. Then it’s just a waste of time and nothing is learned. 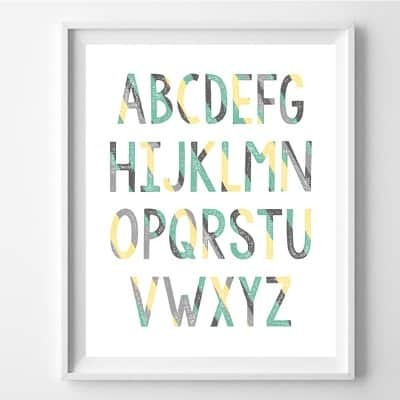 Sometimes coloring is fine but I prefer to review the alphabet letters through other process art techniques like painting with balls. I keep a sturdy box that’s just the right size for painting with balls. That way, I always have one. 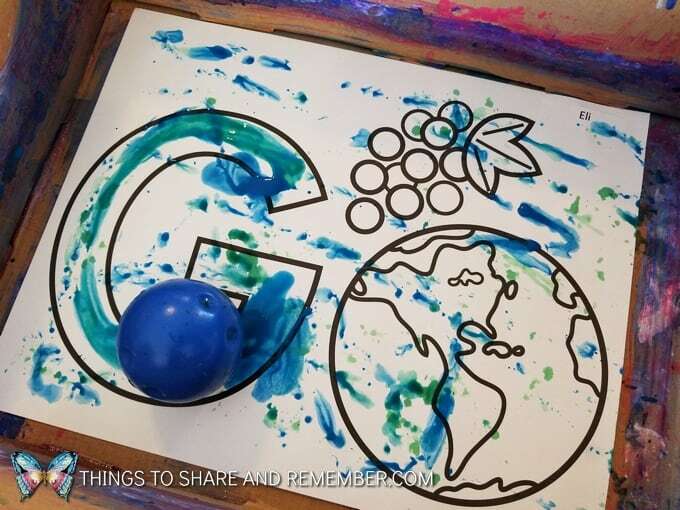 This time we used two colors – green and blue – “earth colors” to paint our page. The process kept each child engaged and enjoying talking about letter G as they worked. 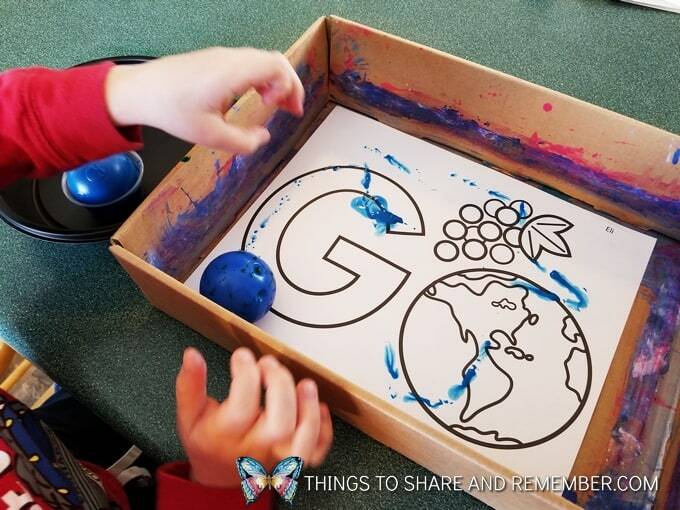 My group took turns doing this activity during free play time so I could say, “G says /g/” and “G is for globe and grapes”. 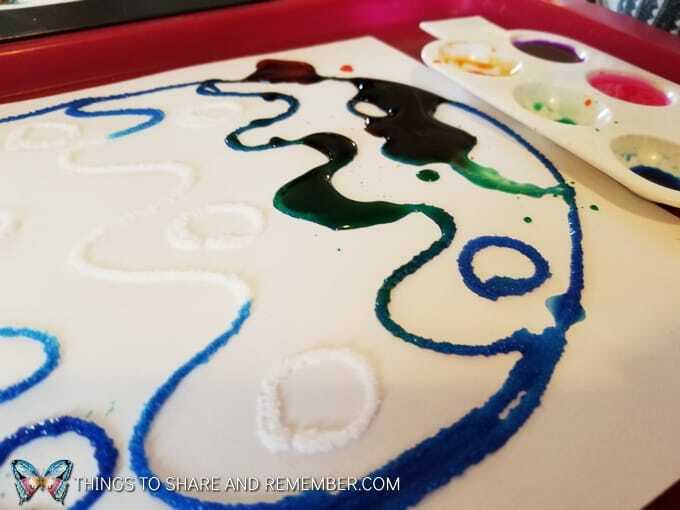 Using simple materials, we explored the colors of the earth as shown in a photo of the earth from a distance. We mainly see blue for water and green for land. 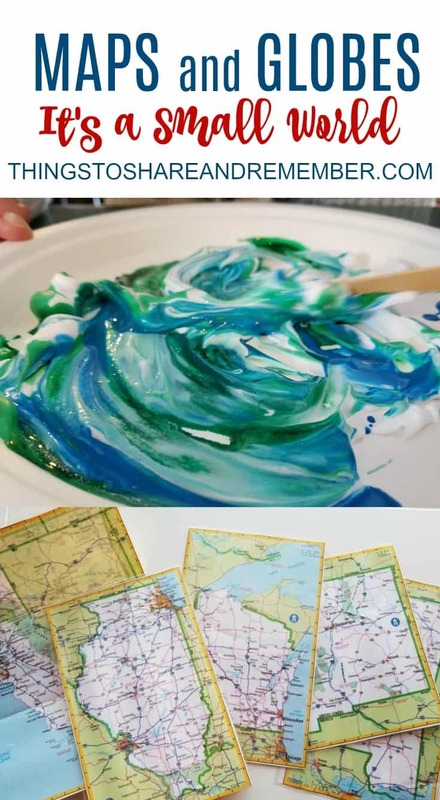 Using blue and green paint along with a little shaving cream (can also add glue) to swirl the colors together on a paper plate to make a earth or globe. We started with toothpicks but finished with craft sticks. 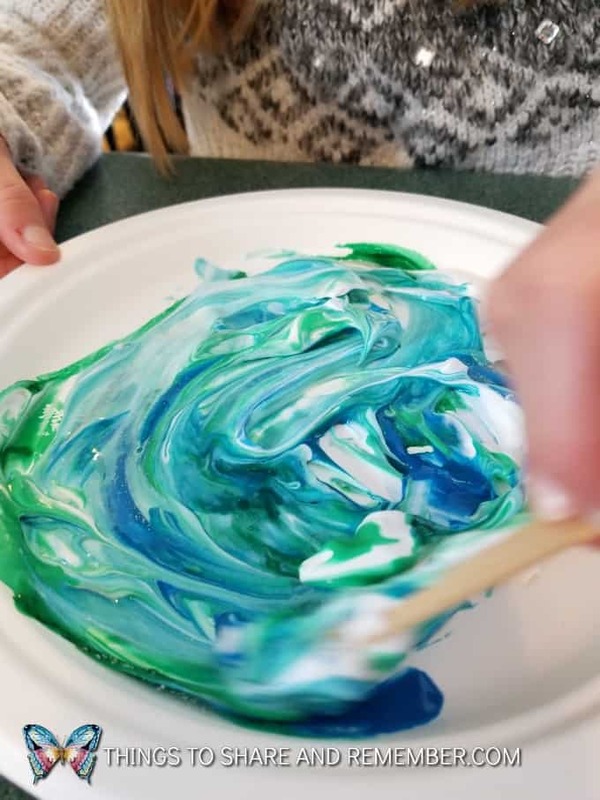 The longer tool was easier to swirl the paint and shaving cream mixture with. The blue is watered down tempera and the green is liquid watercolor. 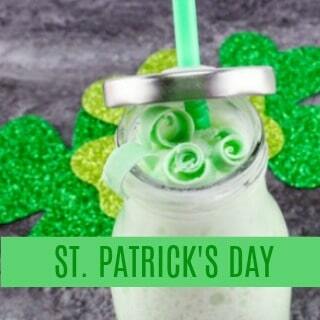 It doesn’t take long to see the colors mix together! Mixing too much leaves you with one color but that’s okay too. 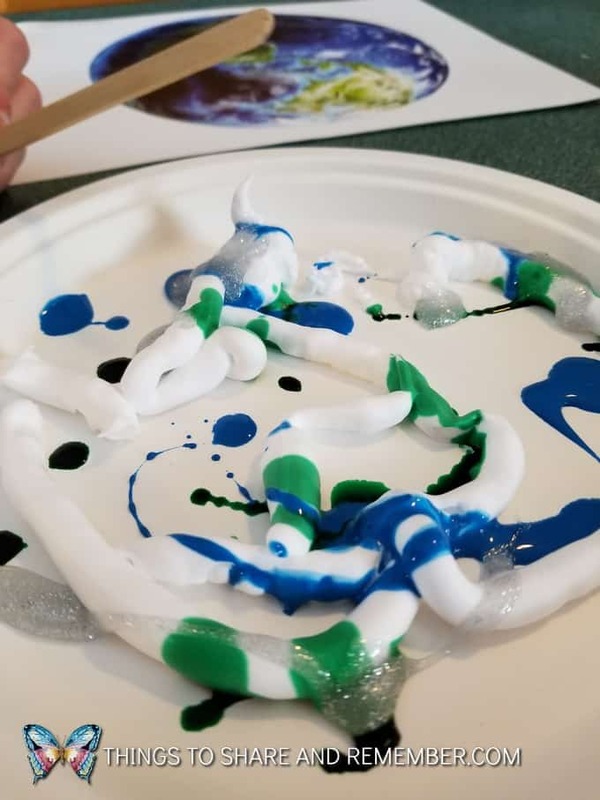 Everyone from 3-8 enjoyed this activity! 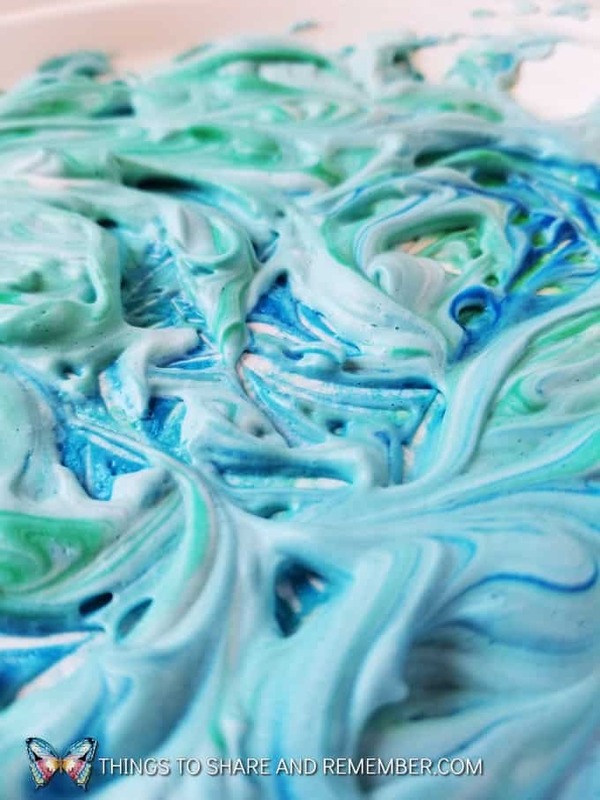 Leave them out to dry overnight and you’ll be left with a foamy texture. 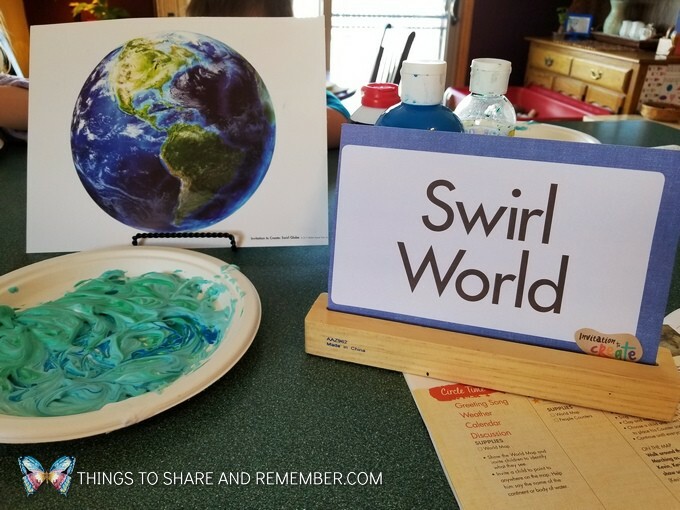 Our swirl world projects look amazing on display! 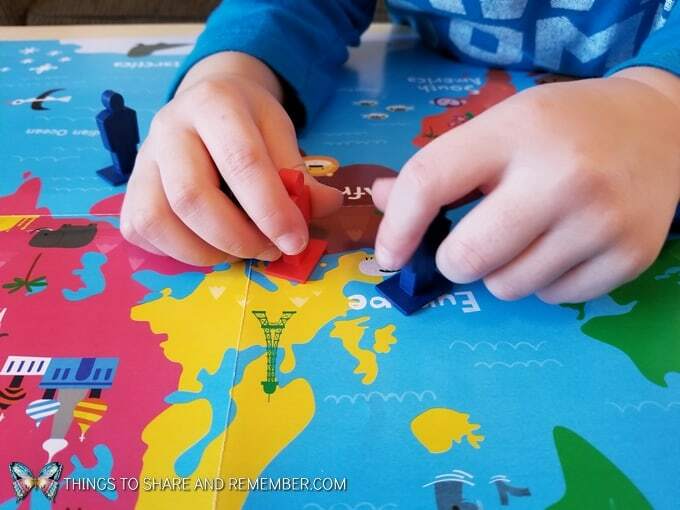 Maps for children can be tricky to incorporate but kids really do like to look at them! Try getting a United States map at the dollar store. It’s huge and it’s only $1. The kids love looking at it and asking “What’s this?” and noting what they see. MGT has this simplified map that’s fun to explore. See all the different landmarks and animals? 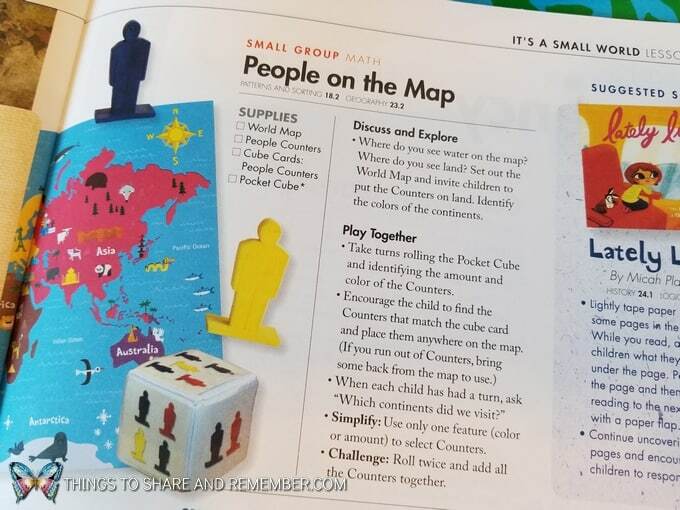 We played a little game called People on the Map. Using the pocket cube, the child rolled and collected the correct number of people. They also identified the color of counters they needed. Then it was up to the child to place those people on the map. Below you can see some in the airplane, others visiting South America. 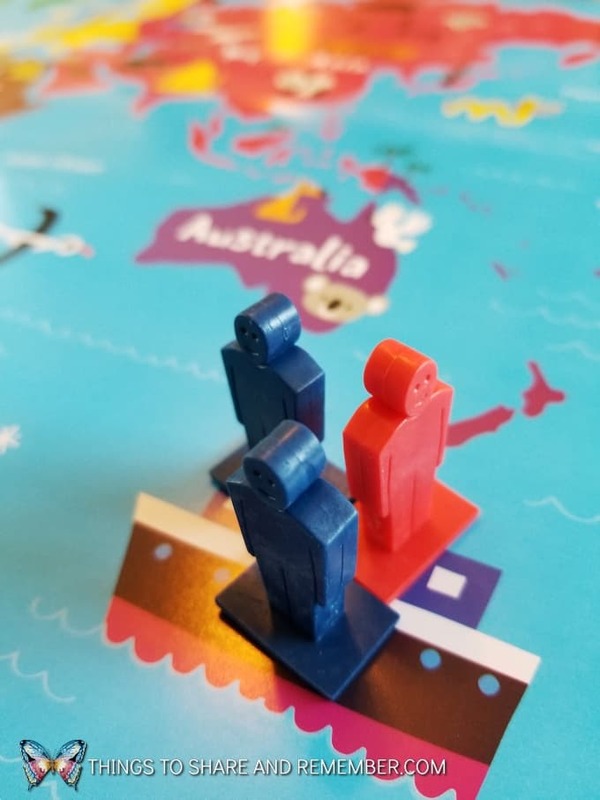 While I sat with each child who was interested in participating, we talked about various places and what clues we could find of what lives in that part of the world or what it’s like on that continent. So a little bit of geography and some counting and fun as well! People on the Map allowed for pretending and other ideas the children came up with as well. 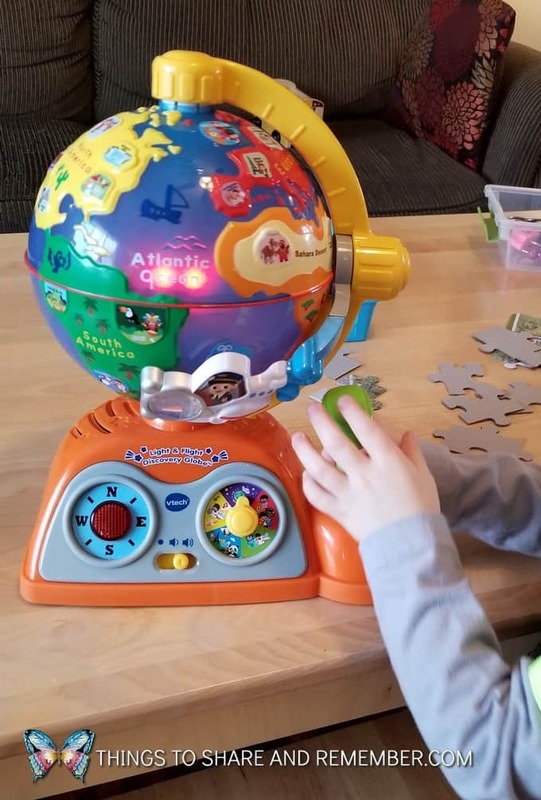 We are enjoying the VTech Light and Flight Discovery Globe along with the It’s a Small World theme because it highlights some of the places we’re learning about! It’s an appropriate toy for my 3-5 year olds. 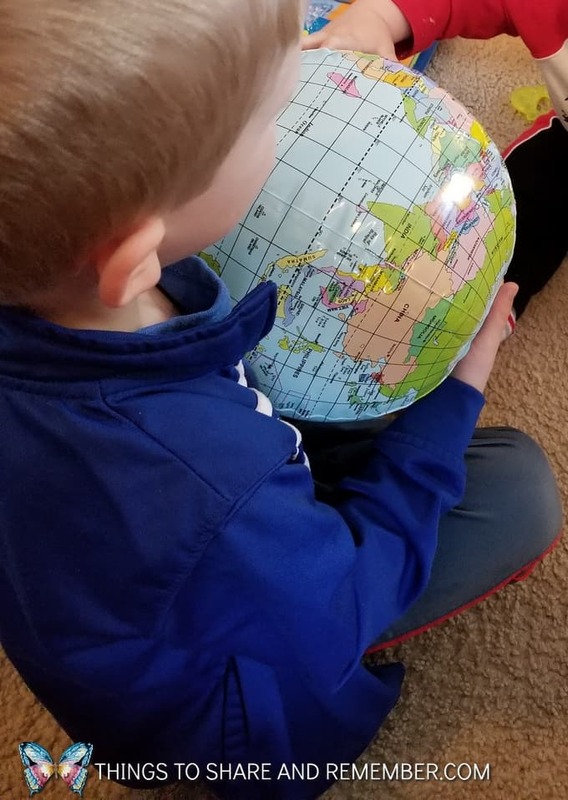 Get an inflatable globe ball or two for hands-on fun! 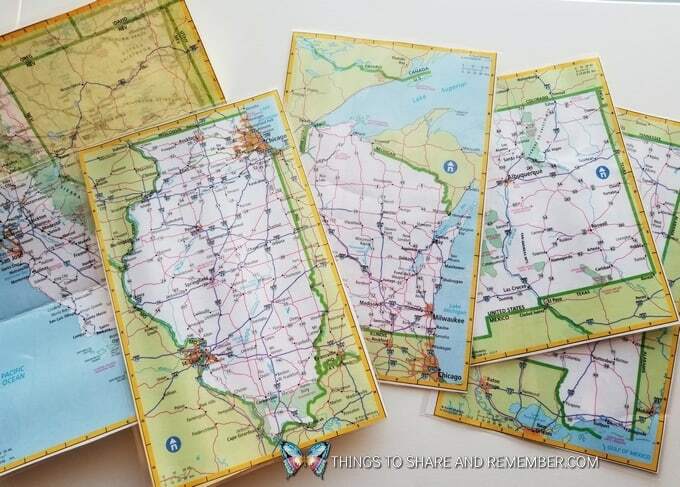 Cut out maps from an old atlas and laminate them for dramatic play. 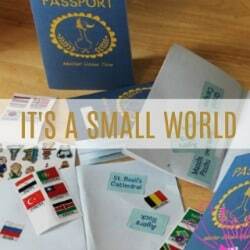 It’s okay if they’re small because then they’re perfect for little hands and can fit in bags. 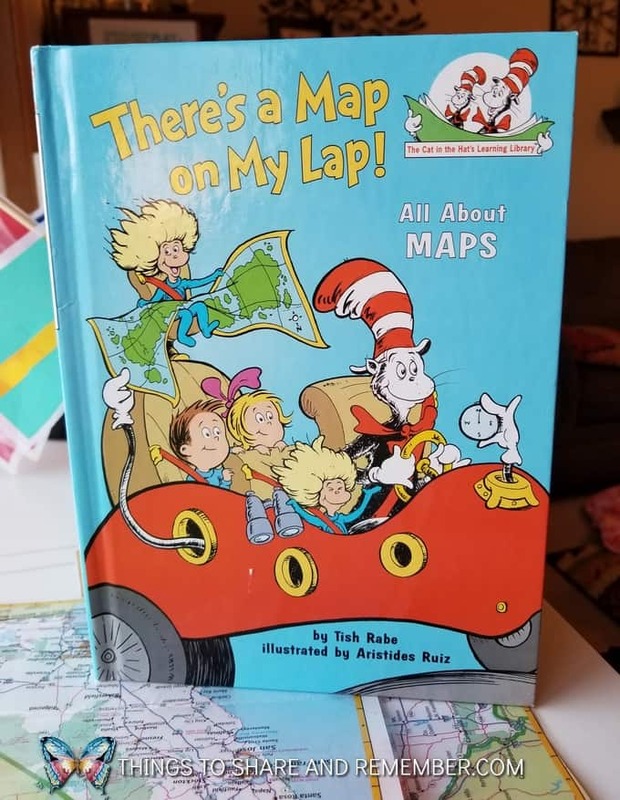 We also read this fun book, There’s a Map in My Lap. 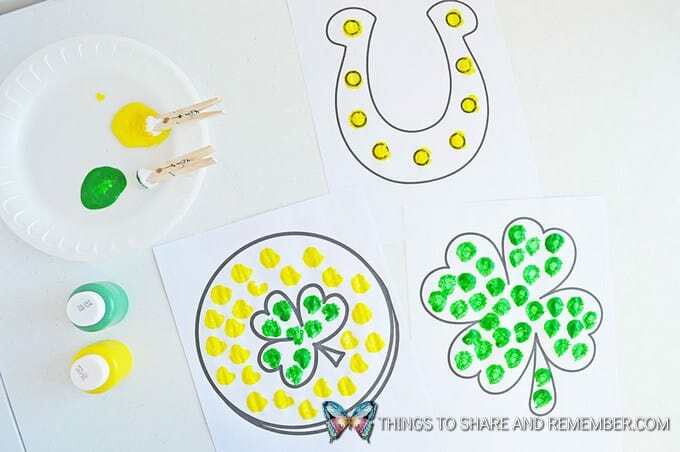 Use a pom pom clipped to a clothespin to paint some fun St. Patrick’s Day Pom Pom Painting pages. 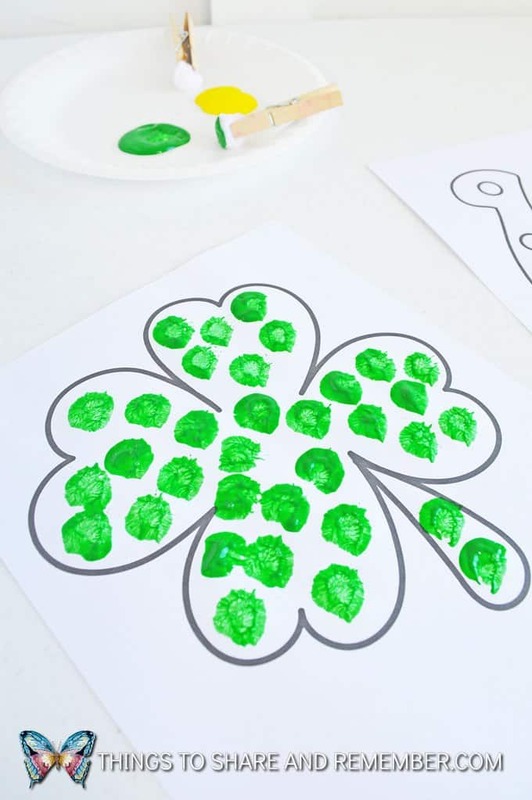 I’ve found that some children will rub the paint and some will make spots. Either method will work great! 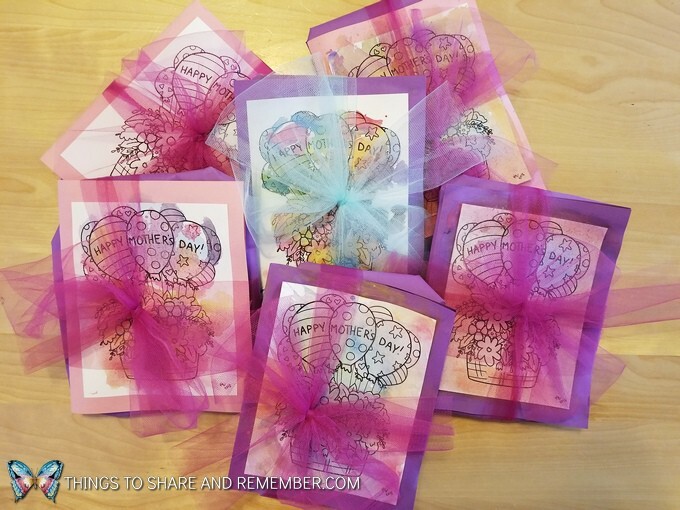 The coloring pages shown are available for download at the bottom of the post. 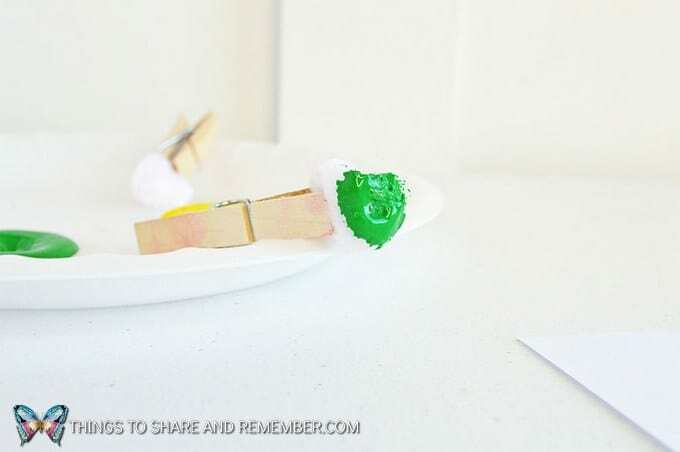 Clip a clothespin to a pom pom to create a fun painting tool. 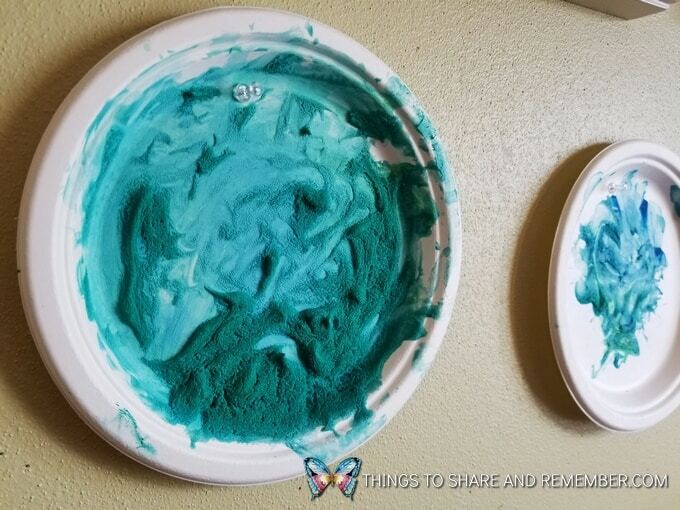 Add a little paint to a foam plate. 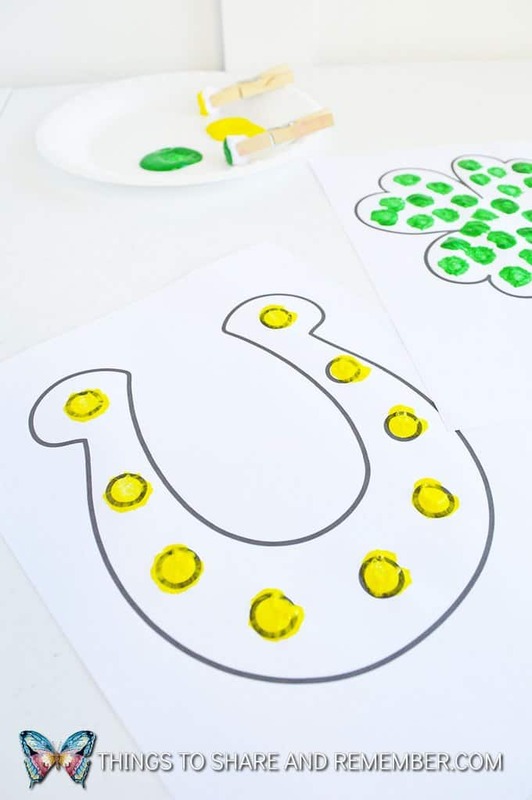 Children love these types of painting activities and it’s a great process art experience. 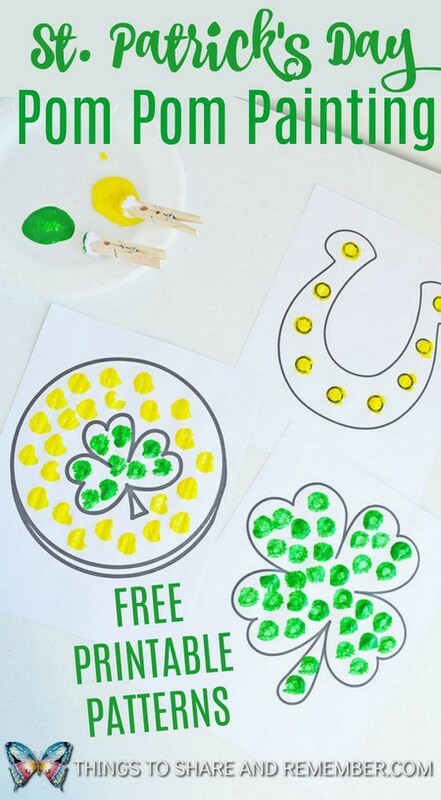 Consider adding a little glitter paint to these. Glitter paint makes every holiday festive!